Wabaunsee County was one of the first 33 counties created by the Territorial Legislature, and was organized March, 25 1859. The county was founded by S. H. Fairfield; John Willig; Dan Horne; and Allen Phillips, and named for the Pottawatomie Indian chief, Wabaunsee. The county contains the cities of Alma, Alta Vista, Maple Hill, McFarland, Paxico, Harveyville, Eskridge and Willard (part). The first white settlers in Wabaunsee were said to have been a band of outlaws known as the McDaniel Gang. They built a cabin near Harveyville from where they preyed on wagon trains on the Santa Fe Trail. Supposedly a box containing $75,000 in gold was stolen. The legend says that much later, a "preacher-fisherman" came to the area, dug up the gold from beneath the ruins of the cabin and left as mysteriously as he came. In 1854 the Beecher Bible and Rifle Church was established by the Beecher Colony from Connecticut. This group of free-staters had rifles shipped to the church to be used in the free-sta te effort in boxes marked bibles. Captain William Mitchell, Jr., a seaman, returned to his home in Connecticut just in time to join the Beecher Bible and Rifle Colony that settled in Wabaunsee. He played an important role in early Wabaunsee settlement, and with the underground railroad. He was elected captain of the Prairie Guard Militias and led his men in the defense of Lawrence. In 1868 he was elected to the state legislature. An 1867 law abolishing the "open range" and providing for payment of 40 cents per rod to a landowner to build and maintain a four-and-one-half foot stone fence around his property effectively opened the area to farmers and others who wished to fence in, or protect, their property. The first church was the Wabaunsee Church of Christ founded in June, 1857. The first county fair was held in Wabaunsee in 1869. The first school district, formed on October 4, 1859, comprised the whole of Wabaunsee Township, with the school in the town of Wabaunsee. Marine Corps General Lewis M. Walt, Jr., a native of Harveyville, was commander of the 3rd Marines and chief adviser to land forces in Vietnam from 1966 to 1967. In 1967 he was promoted to assistant commandant of the Marine Corps. He retired in 1971. Wabaunsee has such interesting sites as Pierce Creek Ranch in Paxico, the Beecher Bible and Rifle Church in Wabaunsee, the Old Stone Church in Maple Hill and the Snokomo School in Paxico. 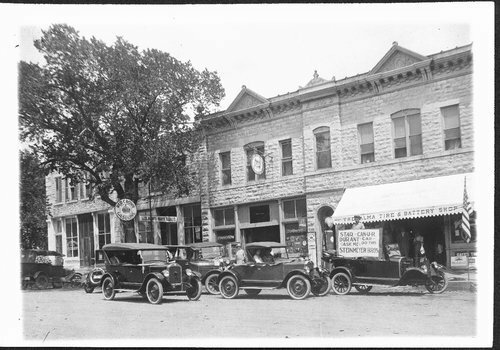 For more information see the Wabaunsee County website.The Wabaunsee County Historical Society in Alma, and the county courthouse, have records, publications, and artifacts relating to the history of the county and territorial Kansas.